"Slow down the important things in your life." This was advice from Michael J. Rosen to a group of aspiring children's writers at the Mazza Museum Summer Conference in 2013. I wrote these words in my journal so I would remember to apply it to my own writing. This week as I reread all the things I learned from Michael J. Rosen during that week in July, I realized that this advice not only works for me as a writer but as a parent. "Slow down the important things in your life." I write these words again so that I remember to apply it to being a father. I am told at least once a week by someone while I am running errands, "Enjoy your children while they are little. The years go by too fast." I usually nod my head in agreement, but hurry off to the next scheduled event. 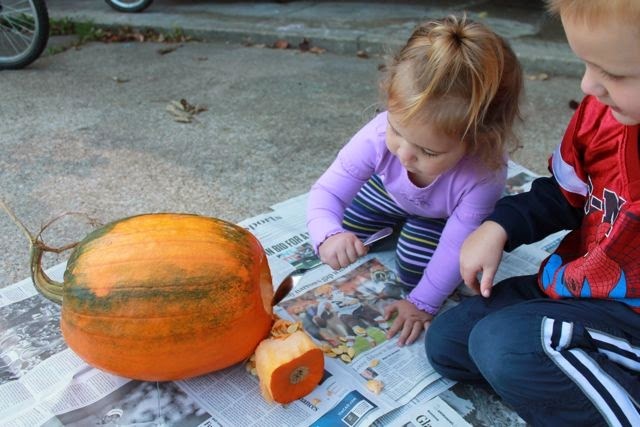 This week, thanks to two books by Michael J. Rosen I was given an opportunity to slow down, enjoy a few of my children's favorite activities, and just have fun! Michael J. Rosen is the author of over 100 books for children and adults including The Cuckoo's Haiku and Other Birding Poems, illustrated by Stan Fellows and A Drive in the Country, illustrated by Marc Burckhardt. He has also written many cookbooks, books about dogs, and adapted his picture book Elijah's Angel: a Story for Chanukah and Christmas into a play. Before all the books, Rosen went to college to study pre-med and attended medical school briefly before deciding to become a writer. He received his Masters in Fine Arts in poetry from Columbia in 1981. (Ohioana-authors). His break into the publishing business came in 1983 when he published A Drink at the Mirage, a book of poetry for adults, which was published by Princeton University Press. (GalleyCat). Also in 1983, Rosen began working and spent 20 years as the literary director for The James Thurber House, a non-profit literary center and museum in Columbus, Ohio. Michael J. Rosen's career has been dedicated to bringing quality books to children, inspiring children and adults to write, and giving back to his local community through his many philanthropic efforts (The Company of Animals Fund and Share Our Strength). 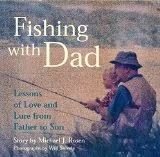 I found Michael J. Rosen's book, Fishing with Dad at the library and I couldn't open it fast enough to read it. It looked like it would be the perfect book for my son and I -- and it was! 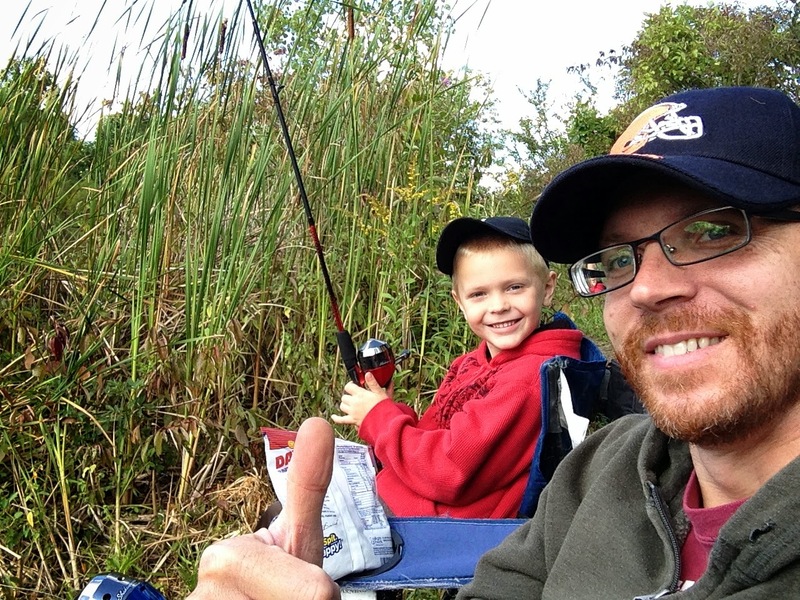 Fishing with Dad is a story told from a boy's point of view about his tradition of fishing on Sundays with his Dad. The day starts with picking out donuts for breakfast, buying bait at Harry and Dot's, and hiking to the perfect fishing spot. The fishing experience is described, "Going fishing is really going waiting...with a little bit of fishing thrown in." 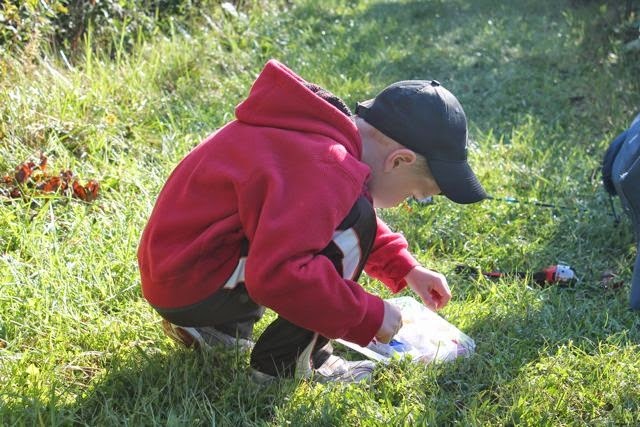 The boy finds other things to keep himself busy while waiting; skipping stones, organizing the tackle box, and looking for treasures in nature. Amazingly, every time the boy's father has to stretch his legs and the boy to watches the lines he catches a fish. The boy can't figure out his luck because his Dad is the "expert" fisherman. The book ends with the boy all grown up and a father himself. The Sunday tradition continues but this time with Grandfather teaching grandson how to fish. As he watches his Dad and his son fishing together his memories of childhood are clear, and he realizes how his Dad made those fishing trips so special. 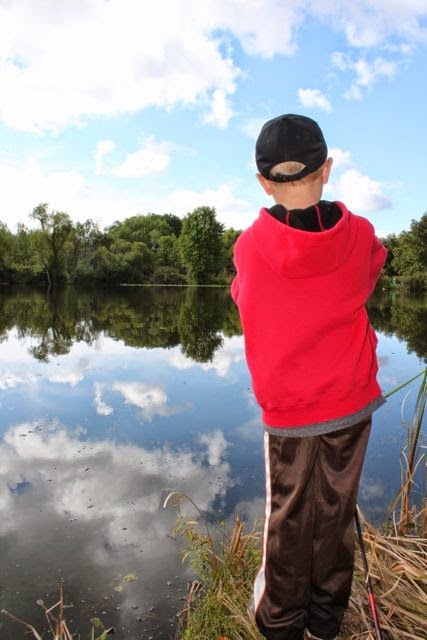 My six-year-old son loves fishing. It started last year when he participated in a local fishing derby and he did quite well catching a half-dozen fish. 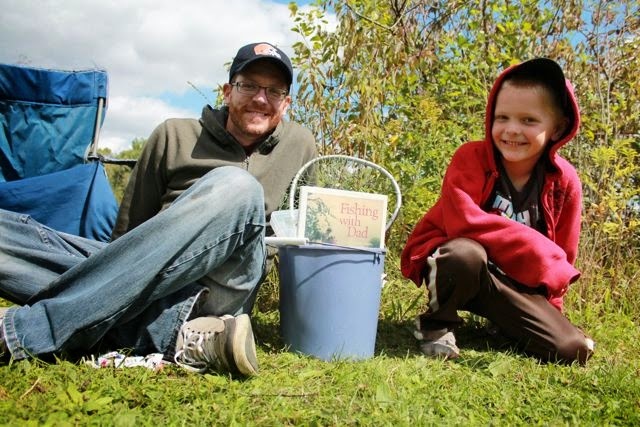 This year, he attended the fishing derby once again and also fished for the first time at Lake Erie. 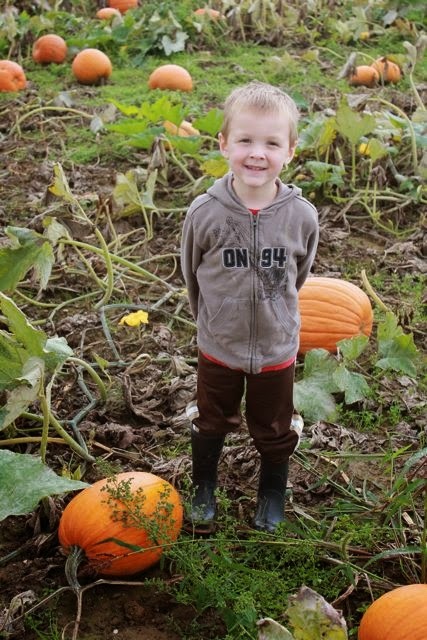 Imagine his excitement when he found out his grandparents' new house has a well-stocked pond in their backyard. During the first overnight visit to Grandma and Grandpa's he fished almost the whole weekend! When he is not fishing for "reel" you will often find him playing Fishing Master on the Nintendo Wii. On a beautiful sunny Sunday morning, my son and I packed up our fishing gear. 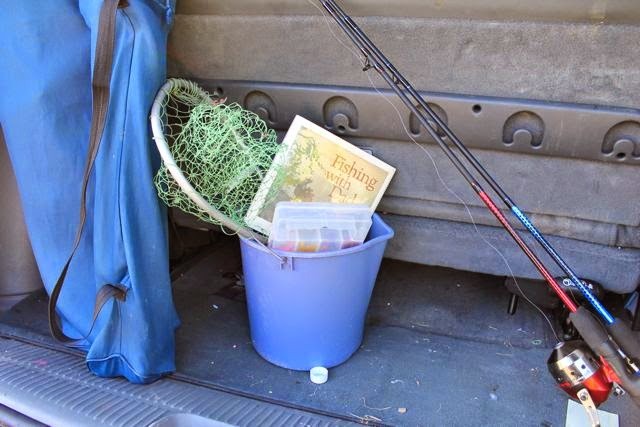 All the normal gear a father and son would pack; lunches, folding chairs, bucket, poles, tackle box, and net. The only thing that we did a little different was to bring along Fishing with Dad. 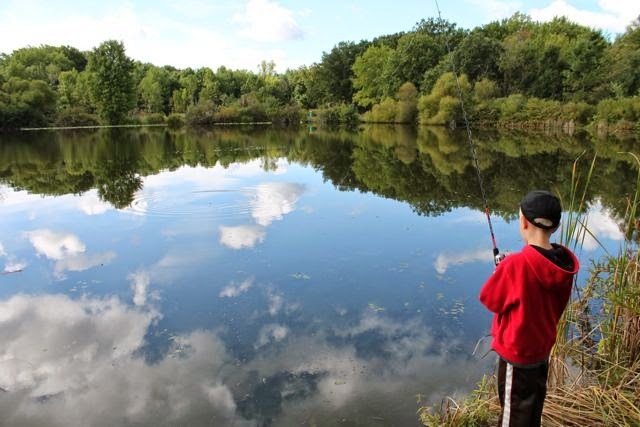 We tried a new fishing spot at Tinker's Creek State Park. We hiked for about 15 minutes to find a clearing where we both could fish comfortably. My son wasted no time. His line was water waiting for his big catch. We couldn't have asked for a more beautiful day -- clear and cool. Fishing with Dad. Notice the bag of sunflower seeds. It was his first time enjoying this simple pleasure! The weather was perfect, but the fish weren't biting. We tried multiple locations around the lake, but didn't catch a fish all morning. 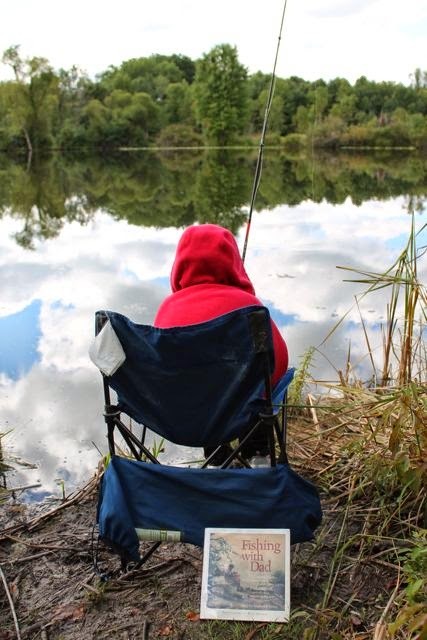 We may not have caught a fish, but like Michael J. Rosen wrote in the book the real reason I went out there was to "catch a beautiful Sunday morning" with my son. 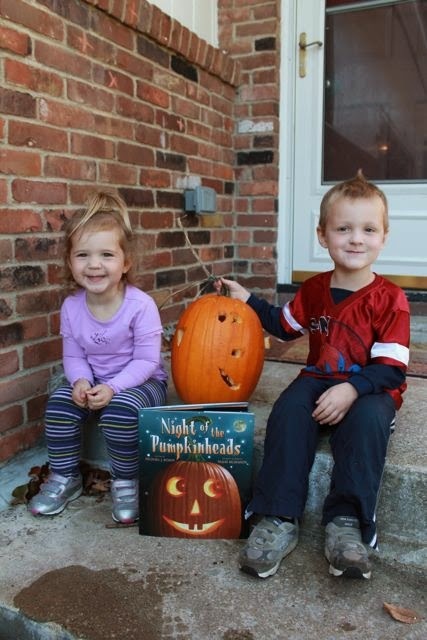 My son loves Night of the Pumpkinheads because the pictures in the book are of real carved pumpkins! In the story the Pumpkinheads are not looking forward to sitting on the front steps of the houses in the neighborhood. 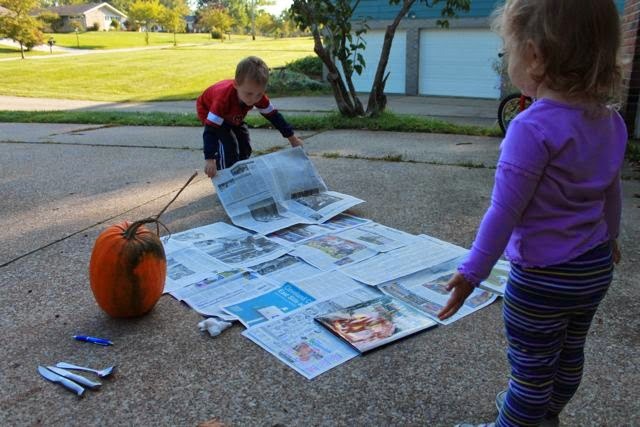 Instead, they devise a plan to spook the trick-or-treaters with their creepy carvings. Word spreads of the plan and the other vegetables on the farm want to join in the fun. 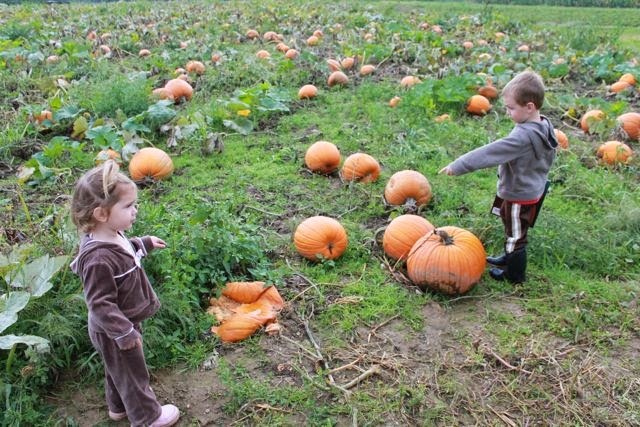 However, the Pumpkinheads want the fun of "Jack-o-ween" all to themselves and laugh at the veggies' belief that they could be scary too. Despite the Pumpkinheads looking like killer bees, skeletons, vampire mimes, and blood-thirsty bats the children of the neighborhood were not scared one bit. The Pumpkinheads were shocked when something truly frightening...very disgusting...and totally gross freaked out all the children at the end of Trick-or-Treat. My children weren't scared of the ending, but roared with laughter and poured over the carved creations on the last page! 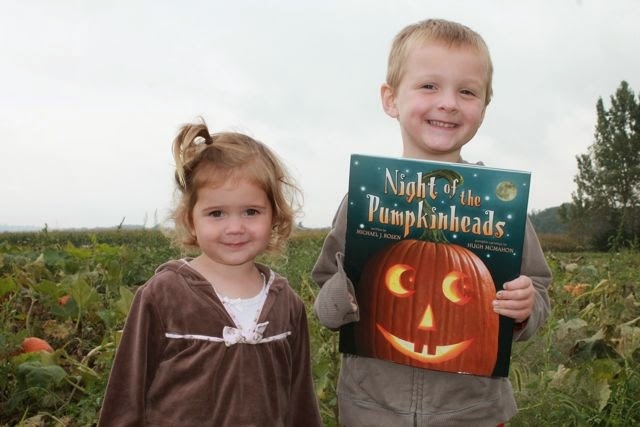 Does it get any better than a good picture book and a pumpkin patch? 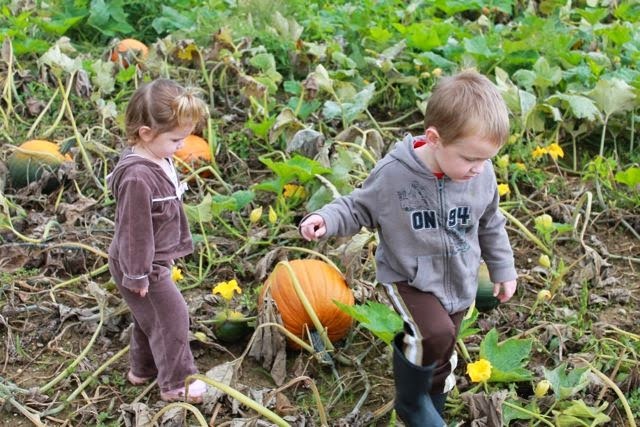 They searched and searched for just the right pumpkin. 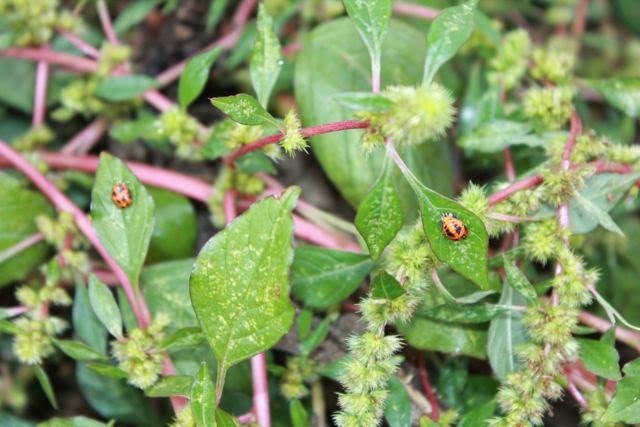 My son was very excited to find ladybug larvae that had entered the pupa stage in the pumpkin patch. 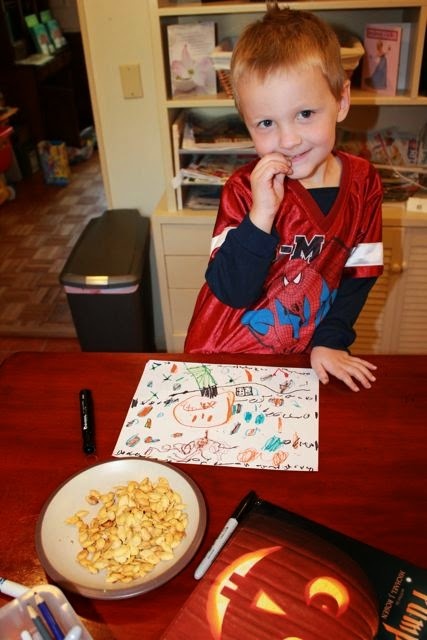 He learned about ladybug larvae during our birthday celebration for Eric Carle in June. He found it! 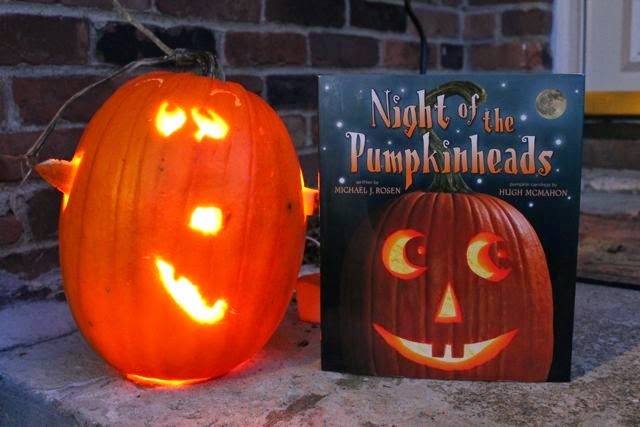 The pumpkin he selected resembled Jackpot, head of the Union of Pumpkinheads, from Night of the Pumpkinheads. Buy a copy of NIGHT OF THE PUMPKINHEADS on Amazon. Our pumpkin carving had to wait until the next day. 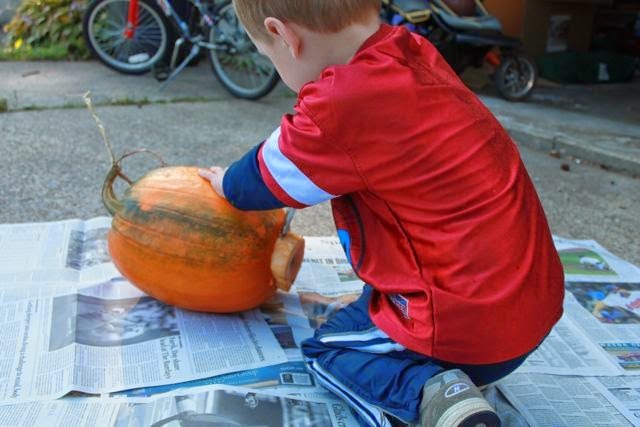 My son set up his pumpkin-carving work area. 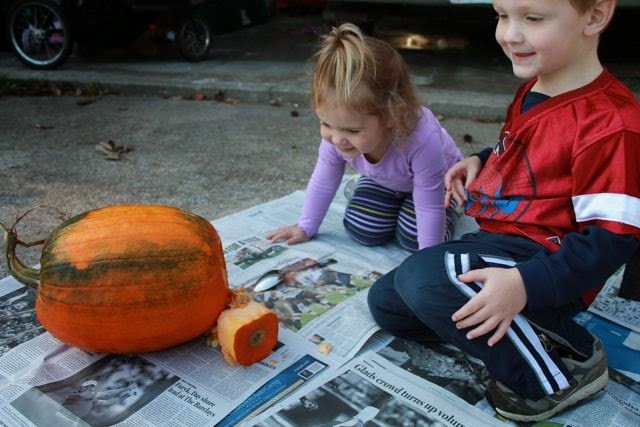 I cut a hole in the bottom of the pumpkin because we used a light to illuminate our jack o'lantern instead of a candle. "Whoa! Look at the guts!" 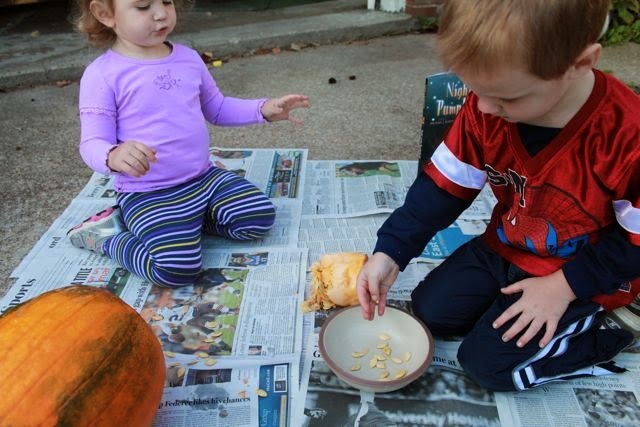 My son said, "The seeds are so slippery." 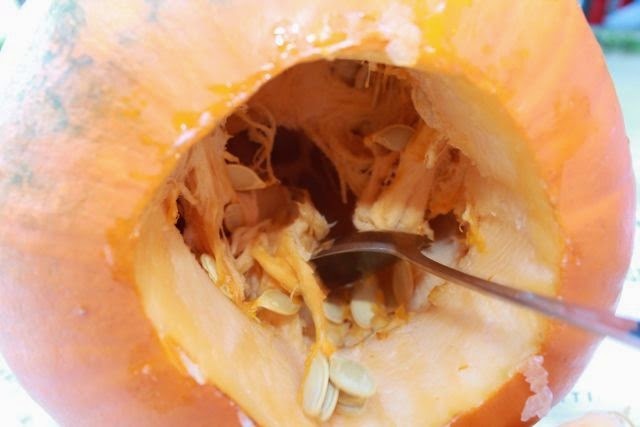 They tried to use a spoon to scoop out the seeds and guts, but I ended up using my hands to clear out the insides. 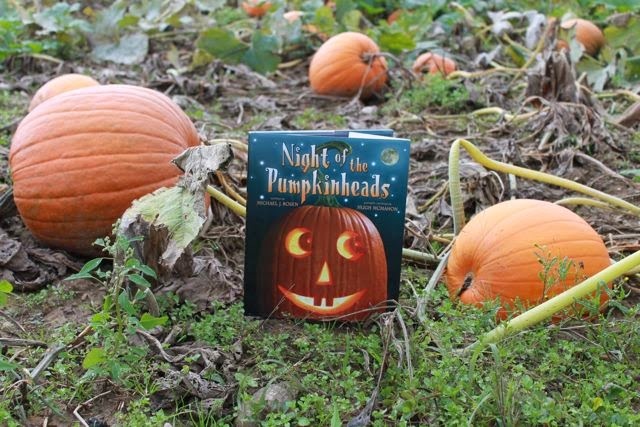 We noticed a recipe for roasted pumpkin seeds in the back of Night of the Pumpkinheads. We collected as many seeds as we could. My son designed his jack o'lantern's face. 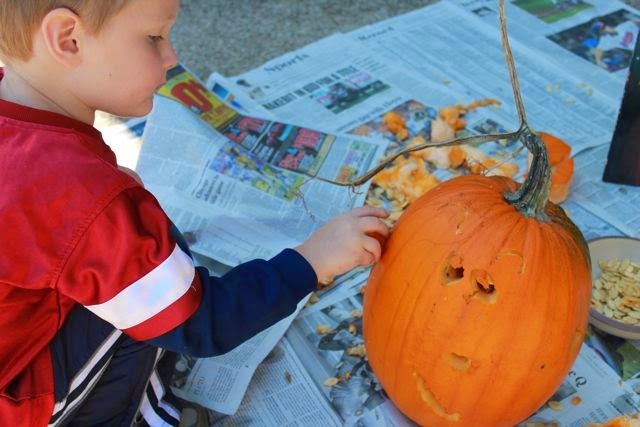 I used an X-acto knife to cut out his intricate jack o'lantern design. My son added pieces of pumpkin to make the ears. He enjoyed the seeds too. 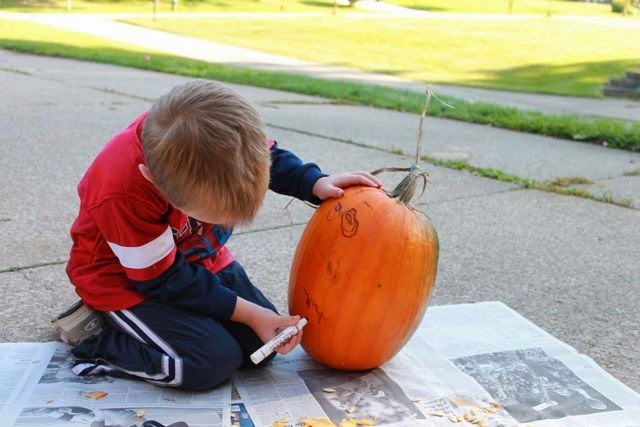 Notice the drawing he made of his pumpkin while he waited for the seeds to bake. 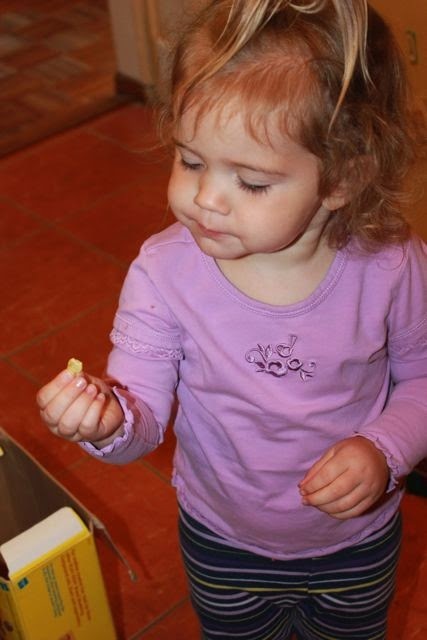 I was surprised she liked the pumpkin seeds too! Please pin our images. Follow Happy Birthday Author on Pinterest! Michael J. Rosen thank you for writing books that allowed me "slow down" with my children. Thank you for everything you taught me in the writing workshop at the Mazza Museum. You have no idea how helpful it was! Our family hopes you have a wonderful birthday!